While there are several tweaks and steps you can take to test and improve your internet connection speeds, one of the easiest and quickest ways to speed up your web browsing is modifying the Domain Name System (DNS) servers. The DNS is like the internet's phonebook, mapping website names like "Lifewire.com" to a specific computer (or computers) where the site is hosted. When you try to access a website, your computer has to look up the addresses, and your choice of DNS server can affect how fast a website loads. The network settings for your computer, router, and/or access point allow you to specify which DNS servers (primary and secondary) to use. By default, these are likely set by your internet service provider, but there may be faster ones to use. Several utilities can help you find the best DNS server by running benchmarks that test how they respond specific to your location. GRC's DNS Benchmark is a great tool for Windows and Linux users, and namebench is a quick and easy tool that runs on Mac, too. Another way to find a fast DNS server is to try one from our Free and Public DNS Servers list. Many offer extra privacy protections, others various levels of filtering, etc. Download and install the namebench utility. If you've never changed the DNS servers your computer uses, then the address should be the same as your default gateway. So, if you know your default gateway, you can skip this step altogether. 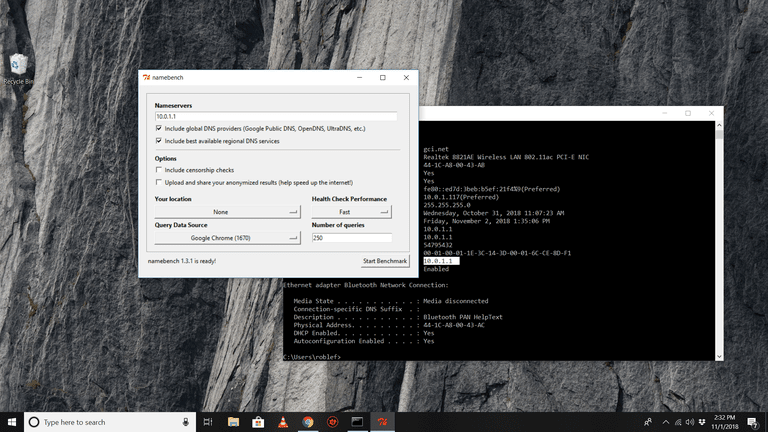 In Windows, open Command Prompt and enter ipconfig /all. Look for the "DNS Servers" line; next to it is the DNS server address. On a Mac, open a Terminal window by going to Applications > Utilities > Terminal, and then enter cat /etc/resolv.conf. In namebench, type your current nameserver address as you found it displayed above, and then select Start Benchmark. Wait for a new browser page to open with your benchmarking results. It might take several minutes or longer. You'll see the recommended primary, secondary, and tertiary DNS servers that can help you get a faster internet connection speed than what you're getting with the current DNS servers. You'll see a list of tested DNS servers and how long they took to load web pages. Write down the numbers for your recommended servers. You can now exit namebench and close the page that opened in your browser. Now you can change your DNS server on either your computer(s) or your router. If you have multiple devices or friends and family who will be connecting to your network, you should log in to your router as an administrator to make the change there. That way, every device that gets its addresses automatically from the router will be updated with these DNS servers for faster web browsing. Or, you can modify the DNS servers on each computer or device. Go to the network adapter settings for your computer, or the Wi-Fi settings on your phone or tablet, and enter the DNS server addresses. Doing this changes the DNS server for that one device only. Our test results showed a 132.1 percent improvement from using Google's DNS servers over using the stock DNS servers, but in real world usage, it might not be exactly that much faster. Still, this one tweak might get you finally feeling like you have a blazing connection to the internet.